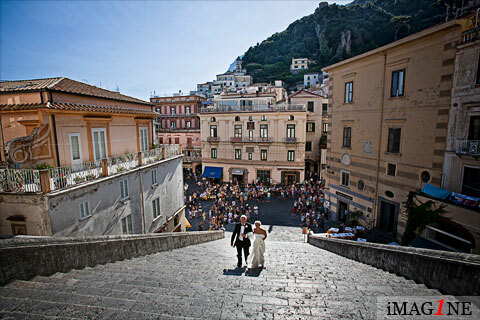 The Amalfi Coast (& Sorrento) offer many options for destination weddings. I've been the chosen wedding photographer for many couples in this beautiful part of the world. It's easy to see why so many have their wedding (& honeymoon) here. As well as the numerous bus services, many of the towns are quickly accessible by the remarkably good value boat services. No-one can mention the Amalfi Coast without mentioning THAT road! A narrow, cliff-edge, wiggly, windy, heart-in-your-mouth experience leading from Salerno to Positano following the wonderful coastline. Along the route you'll discover Amalfi, Ravello, Minori, Maiori, Cetara and Praiano before reaching Positano. 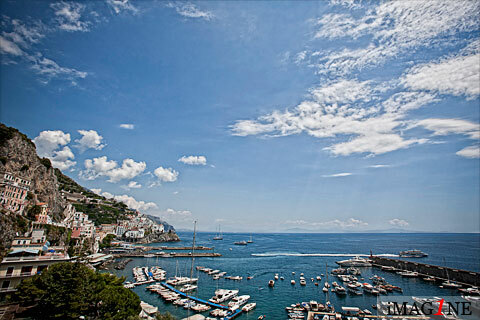 Around the peninsular you'll find Sorrento. Also, don't forget about the famous, beautiful, 'popular with celebrities' island of Capri just off the coast to the west. 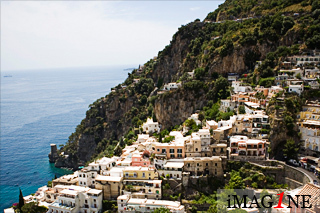 The Amalfi Coast and in particular Amalfi, Positano and Ravello are really popular for destination weddings. The weather is generally great, the food and wine is fantastic and there's a real holiday-romance feel about the area - something essential for a wedding photographer to capture. Around the coast across the bay from Naples, Sorrento, a larger town of over 16000 inhabitants, is a little more accessible & also very popular. From a wedding photographer point of view, it's hard to choose between them all - there's so much to offer here. As a photographer, you have to love Ravello. As you ascend towards Ravello, each twist and turn of the windy road makes you feel more and more intrigued about just what it is about this little town that sees the many tourists and celebrities flock there year in, year out. When you finally it, Ravello doesn't disappoint. The pretty, narrow streets, manicured gardens, impressive villas (Cimbrone and Rufolo), exquisite hotels and boutique shops are wonderful. All of that is gazumped however by the awe-inspiring views. At 365 metres above sea level, the views along the coastline from Ravello are unparalleled, perhaps in the whole of Italy. Ravello Town Hall is where many have their wedding ceremony. It's great for a wedding photographer, especially if it's outdoors, as the access to the couple and guests during the ceremony is generous, yet unobtrusive. I've yet to photograph a wedding at Ravello's Cathedral (on my list of must-do's!) but I have photographed at Ravello's church of Santa Maria a Gradillo which was very beautiful with its pure white interior. 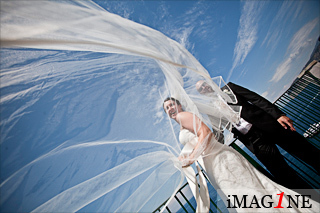 Photographing a wedding at Villa Cimbrone is always an absolute highlight in my calendar. Its famous 'terrazza dell'infinito' has to be seen to be believed and the long walk-way leading to it only adds to the uniqueness of the spot. 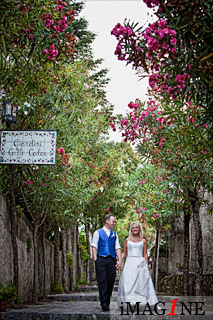 Villa Rufolo is another popular and very beautiful wedding venue in Ravello. Amalfi was once of high maritime importance. Today, it's busy but generally by way of local ferry services, yachts and fishing boats. Amalfi Cathedral is situated in the heart of the town at the top of a set of steps. I was the wedding photographer at Amalfi Cathedral for the wedding of Guy & Helen in July 2010 and as you can see in the image opposite, the walk up the steps makes the arrival at church quite a memorable one! As well as the opportunity to have your wedding in this fabulous cathedral, couples are attracted to Amalfi because of its vibrancy, position and the number of great venues to choose from. As well as Amalfi Cathedral couples can choose to have their wedding ceremony in Amalfi Town Hall, formerly a Benedictine Monastery dating back to the 12th century. Positano was a relatively poor fishing village until the tourists started to flock there in the 1950s. It's pretty unique in the way that it is positioned as it seems to cascade down the cliff and into the sea. An exceptionally romantic location for a destination wedding, Positano is really colourful. Wonderful views for artists and photographers (a wedding photographer in particular!) to marvel over and get inspired about. No surprise then that Positano has been featured in several films. The wedding ceremony at Positano Town Hall may take place on a high roof-terrace with a steep drop off over the town and sea. A really special and unique wedding ceremony venue compared to what we're accustomed to in the UK. Yet another Italian beauty spot and popular place to get married. A much larger town than those situated along the Amalfi Coast, it is situated on a terrace with sheer rocky cliffs falling down into the sea below. The view of the Bay of Naples and Mount Vesuvius is stunning - it's so unique and as the gigantic cruise liners come and go, Sorrento and the surrounding sea is a hub of activity. The region is famous for growing lemons and the production of limoncello (a personal favourite of mine). I've seen lovely little bottles of limoncello being given as favours at a wedding in Sorrento before now - a lovely idea. If you're thinking about a wedding in Sorrento then you'll probably want to consider getting married in St Francesco Cloisters or The Cloisters, Sorrento as it is also known. I can put you in touch with an excellent wedding planner who has lived on the Amalfi Coast for many years - just ask me for her details. If you're looking more generally at wedding destinations and have yet to make up your mind where your wedding will be, perhaps you'd like to try my wedding photographer's guide to Tuscany & Umbria.